You can experience a life of perfect peace! Discover God’s principles to be free of fear and anxiety. 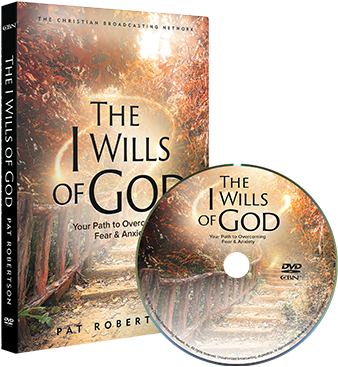 In CBN’s latest DVD release, The I Wills of God: Your Path to Overcoming Fear and Anxiety, Pat Robertson brings you life-defining insights into one of the most powerful passages of Scripture—Psalm 91. Find True Satisfaction, and much more. Together with co-host Scott Ross, Pat gives you the tools you need to get beyond the crippling effects of fear and worry, to live a life of victory and power. The Word of God is living and powerful, and this teaching on Psalm 91 will be a shield and comfort to your soul. The I Wills of God can transform your thinking and set you free from fear. Strengthen your faith as you experience stories of God’s deliverance from anxiety and brokenness, sickness, life-threating situations, and more, in CBN’s newest DVD, The I Wills of God. It’s our gift to you when you partner with CBN . Hear from Pat Robertson’s new teaching on Psalm 91—The I Wills of God: Your Path to Overcoming Fear & Anxiety. Discover the root of fear and learn how to overcome its hold—freeing yourself from fear for good! If Jesus quoted the Word of God Shouldn’t You? Learn How Using God’s Word Can Transform Your Life! Pat Robertson shares the how you can hear from God in any situation. When you partner with CBN you’ll be helping to take the Gospel of Christ to the world and will bless so many through humanitarian relief, orphan care, medical treatment, community building, and so much more! You’ll also get instant digital streaming to watch the DVD whenever you like. Get Instant access to over 1,500 video titles, teachings and Christian programming for the whole family. You’ll get an audio copy of The Gospel of John and new exclusive teachings every month by Pat and Gordon Robertson when you sign-up with electronic giving. CBN is accredited by The Evangelical Council for Financial Accountability (ECFA), a financial standards advocacy group that accredits organizations that comply with its strict financial standards.